One of my passions is teaching adults. In general, adults who attend a class, whether in school or in church, want to learn something. Lately, however, I have been an instructor to students who do not really care to learn but, instead, are in the class to receive a grade. More specifically, they are in the class to receive an A, whether their work reflects that level of understanding or not. This is incredibly frustrating for me as an instructor. (I will be using "this student" a lot in the next few paragraphs as I do not wish to reveal anything about the students I am talking about). I realize that part of the problem may be the result of my inadequacies as an instructor. Therefore, I am always looking for ways to improve a class, create better assignments, and sharpen my teaching skills. However, I am seeing more and more students who are not interested in learning anything from the class but are only interested in how to obtain that all-important "A". Case in point: I just completed an Ecclesiology class at the Colorado Springs branch of a college at which I am an adjunct professor. This is a class dedicated to the understanding of the theology of the church and how the church is governed. To begin with, there was one student who had taken the class with me before but the student failed in the previous attempt to complete the class. So this was the students second time around. I told this student, "DO NOT turn in the papers I graded last time for this class! That would be self-plagiarism and would carry serious consequences." However, by week 2 of the class, this student was copying work from the previous class and turning it for a grade...again. This student did this for almost every assignment in class. This meant that each assignment failed the meet the criteria AND I turned in the work to the center director so that they could take action on it. This student was not interested in receiving an education; this student was interested in receiving a grade with as little work as possible. This student did receive a grade but not the one he or she was hoping for. Another student in the same class was almost panicking because this student received a "C" on a major research paper. And that is exactly what it earned. It was not above average in its observations or its errors. It was average and so that is the grade this student earned. This student nearly went ballistic when the student saw the grade and immediately starting to ask for extra-credit. This student's comment was, "I have to redeem myself. I have never failed a paper before." These comments baffled me as I attempted to explain to the class that a "C" is good grade and it is not failing. 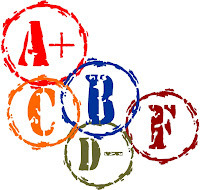 However, for many adults students there are two grades: A and F. If they do not get an A on a paper or in the class, in their minds, they have failed. I should note that after I assigned the extra-credit assignment, this student did not really fulfill the requirements of the assignment (which is technically the definition of a "D") and ended up with a "C" on the extra-credit assignment (I showed too much grace, I know). My point is, I am not sure this student learned anything about the church and I do not know if this student knows the material in the class impacts this student every Sunday. But at least this student received a "B" in the class (there were other assignments which this student stepped up the quality of work and with the extra-credit pulled a "B" out of the class - which I am sure disappointed this student). Another student in the same class attempted the extra-credit assignment because this student was very concerned they were 1/2 of a degree point between a B+ and an A-. Now, I do believe that this student did learn something in the class but it seems to be quite a lot of work to make sure you get that all-important "A" (the extra-credit assignment was reading an 18-page article and then writing a summary about that article). When this student turned the assignment, it was almost completely plagiarized from the article. In the first two pages of the assignment there were maybe 10 to 12 sentences which were original. The rest were directly from the article with no citations. I told this student that, first, I would not accept this paper and if I did accept it, I would have to turn it into the office for plagiarism violations. Secondly, I usually round up to the nearest whole number, which means even without the extra-credit, this student would receive an A- (the other assignments were great and I am not sure what possessed this student to do this on the extra-credit). These students were all Juniors or Seniors when counting their credit hours and they all should have known better. I expect this type of thing from adults who have not been in school since 1974. But these students had been in this particular program for at least a couple of years. I could go on but I will not. My point is, I have seen more and more students with the entitlement mentality.There argument is something like this: "I have paid a lot of money to be in this class. I have shown up every week and have stayed relatively conscious. I have turned something in every time something is due. Therefore, I should receive an 'A' for the class." My next post will deal with my response to these type of students. For now, I just would like to say that I frustrated with struggle between students wanting a grade instead of an education. I know I am not the only instructor who deals with this but is frustrating nonetheless. As a fellow educator, I totally understand how students and their lack of ethusiasm about learning can try a soul. It was wonderful to find your blog. I have enjoyed reading your insights. HEY KIMBERLY!! I got you email the other day and then when I went to email you back I lost it and life happened and then more life happened...no good excuse but I am glad you got ahold of me. How are you doing? Rhonda, Jessica and I great - except Jessica had knee surgery today...that sounds familiar, doesn't it?? Hey there back...Got time to sit down and check back in. Rob, my hubby, and our two-year old son, Landon are downstairs with a bath. They are such a blessing in my life..."my guys" as I call them. This is my 13th year at Manhattan High School teaching at-risk teens. Many a story I could share. Please give your ladies a hello from me. I will be praying for successful healing of Jessica's leg. Keep in touch, when you can. I'll have to send you a picture of my little guy...Shoot me an e-mail when you can and I'll send the picture that way to you.